How to Convert A Number To Scientific Notation? A × 10n where 1 ≤ |A| < 10 and n is an integer. 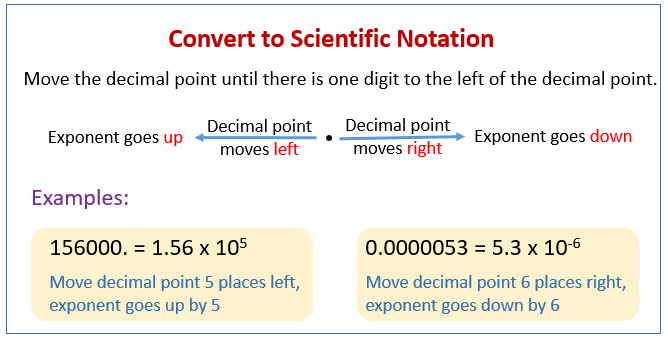 The following figures show how to convert decimals to scientific notation. Scroll down the page for more examples and solutions. Rewrite the number as a product of a number A such that 1 ≤ |A| < 10 and a power of 10. Step 2 : Count the number of places that the decimal point has moved. The count would be the index n. If the decimal point was moved to the left then n is positive. If the decimal point was moved to the right then n is negative.